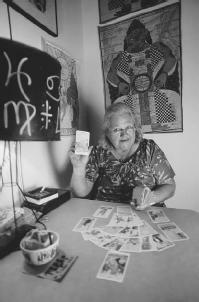 Seeking to foretell the future through a deck of cards (cartomancy) is an old and time-honored practice and a favorite of many professional, as well as amateur, psychics and seers. The exact time and place in which playing cards originated is unknown. However, it is certain that the cards were originally used as tools of divining the future, not for playing games. Some authorities attribute the popularity of using cards to predict the future to the Gypsies, but it is difficult to separate such an assertion from the many stereotypes of the occult and the mysterious that have been visited upon these nomadic people. Whether or not the origin of card reading can be attributed to the Gypsies, there is a loose consensus that it was wandering tribes of gypsies who brought the prototype of what is today considered a deck of cards to Europe some time in the fourteenth century. Although it is thought that the Gypsies came west from India by way of Persia, they often claimed that they were originally from Egypt. To make such an association with the ancient mysteries of the Nile added to their status with the Europeans and also increased the aura of the mysterious that they sought to create around themselves. Portraying themselves as diviners in the magical traditions of Egypt, the Gypsies began reading fortunes with picture cards called atouts that were popular in Persia. When the deck underwent a transformation in Europe, it was called tarots. These decks were similar to modern packs, but there were 78, rather than 52, cards, and the suits were not the familiar diamonds, spades, clubs, and hearts, but swords, cups, coins, and rods. 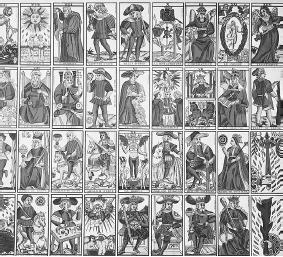 Rather than king, queen, and jack, the tarot deck had 22 picture cards, and the king, queen, knight, and knave (or page) joined the "spot" cards from 10 down to one for each suit. The theory perhaps closest to the true origin of the tarot cards as they appear today dates from the Renaissance (14th–17th century). Prior to this time, Gnostics, who are believed to have introduced the tarot into southern Europe, had to take their faith underground in order to escape persecution. To preserve their teachings, they recorded the fundamentals of their beliefs on a set of 22 plates that depicted the spiritual growth of humankind. Each plate, or card, in the 22 major mysteries (the Major Arcana) told the story of a single aspect of an individual initiate's inner spiritual progress to the state of complete perfection. The Major Arcana follow humankind's spiritual pilgrimage toward the state of final perfection. The Minor Arcana trace humanity's journey through time. Essential to the understanding of the tarot is the doctrine of reincarnation, which teaches that each soul must experience birth into both sexes and all five races before it can attain final perfection. The tarot, which some authorities describe as one of the world's oldest books disguised as a pack of playing cards, has remained a popular method of divining the future. Combining esoteric wisdom with the Hebrew system of numbers, many individuals maintain that it is likely that the philosophy of the ancient Kabbalah was the spiritual ancestor of the philosophy of the tarot. Enthusiasts in the New Age Movement have rediscovered and embraced the teachings of the Kabbalah and the ancient Egyptian wisdoms believed to be instilled in the cards. Although many authorities have suggested that the tarot cards were adapted from the pages of the legendary Egyptian book of magic, the Book of Thoth—and certain of the imagery on the cards encourages these perceptions—such an assertion cannot be proved. What does appear to be authentic lore in regard to the tarot cards is the fact that the Gnostics, during a period of persecution, recorded the fundamentals of their beliefs on plates similar to the cards of the tarot's Major Arcana. Adepts of the Kabbalah formalized the figures and established 22 allegories to correspond to the 22 letters of the Hebrew alphabet, maintaining that each letter was itself a divine being with occult powers of its own. accomplish as individuals. Again, the situation is the same in the realm of the tarot. perceives as best providing him or her with a window to the querent's future. The Juggler or Magician (arcanum one) stands with one hand raised to heaven and the other pointing to Earth, thereby confirming the teaching of Hermes Trismegistus that what is in heaven is like what is below, that the little world (microcosm) within a human being contains the elements of the universe (macrocosm), and that the study of humankind can lead the adept to an understanding of all creation. The number one signifies the first principle, unity, and in every religion it is the number representing the Divine Being. One is also the number of the soul of nature, the soul of the elements, and the active, causative and creative force of the unseen universe. The High Priestess (arcanum two) is the most holy card in the tarot deck. It represents humankind's innate ability to interpret the word of God, the highest form of intellectual activity. The High Priestess symbolizes the knowledge hidden in the subconscious of every human being, and her image offers the wisdom that in order to tap the wellspring of occult knowledge, one must search one's own subconscious. Number two stands for the mother principle and represents the expression of unity through woman (one and one). The Empress (arcanum three) is the symbol of feminine instinct, a thought or solution that arises directly from the subconscious. The number three is the key that unlocks the door to intuition and is the driving energy that unites positive and negative, male and female. On the material level, the Empress card represents the human aspect of love and symbolizes the sexual conjunction of male and female. The Emperor (arcanum four) warns that no one can compromise with his or her conscience. The Emperor of wisdom is activated by the fire of the vital force within all humans and regenerated by the alchemical slogan that all nature is regenerated by fire. The number four represents the primordial substance that is the origin of all the universe and is the numerical constituent of all manifestations in the third dimension. The Hierophant, or Pope (arcanum five), stands for the search for truth and represents all organized religions, education, schooling, and any other kind of formal learning processes. The Pope, the interpreter of sacred mysteries, points the way to the pathways of silence and watchfulness and enables seekers to discover the inherent power of creative ability that lies dormant within them. Number five stands for the universal power of faith over human imagination, the faith to be creatively new. The Lovers (arcanum six) represents marriage, the love of sibling for sibling, of parent for child, or the mystical bond that unites all those who are alike in soul. Number six signifies spiritual development, charity, and divine love and represents the duality of every problem in terms of both attraction and repulsion. The Chariot (arcanum seven) driven by the king—its horses and wheels seemingly pulling away from each other, yet drawing the same vehicle—is an allegory of the struggle of the negative and positive forces that operate in all people during their journey toward the spiritual life. The Chariot symbolizes the victory of the inwardly united individual over the obstacles of life. Number seven represents the Fatherhood of God and divine realization. Justice (arcantun eight), as it is expressed in the tarot's imagery, is not blindfolded. The ancients pictured Justice as a woman of mature age with large, open eyes; it is modern culture that has pictured Justice as blind. Justice also represents self-initiation into life's adversities, during which one looks inwardly and without bias at one's true self. The number eight signifies dualism, positive and negative, and the actions of unseen forces on matter. The Hermit (arcanum nine) stands for every spiritual seeker in search of himself or herself. The Hermit pursues the lonely path of the awakened soul in his search for truth, guided by his lantern and protected by his staff. In essence, this card represents the experience of self-initiation and signifies wisdom and silence. Nine symbolizes astral light, the matrix of all visible forms of life. The Wheel of Fortune (arcanum ten) is the card of victory, the sign of obstacles overcome by good fortune and by the active participation of the individual in the activities of the microcosm. The Wheel, or circle, is the symbol of completion, as every human is a closed system within himself or herself. A blind virgin cranked the Wheel, as all humans are controlled by unperceived psychic powers. Humans must learn to use their psychic abilities to control their life, rather than allow their life to be buffeted about in a blind manner. The Force (arcanum eleven) symbolizes the inner strength by which one may overcome obstacles placed in the path of spiritual progress. Eleven is the number of the Aquarian Age, and represents universal energy— prana. Eleven also symbolizes spiritual will power, vitality, and/or intense strength. The Hanged Man (arcanum twelve) represents taking on the new and giving up the old. This card allegorizes the prudent adept of arcanum nine (The Hermit), who has now freed himself from the Wheel of Life and Rebirth of arcanum ten. The adept has been elevated to glory through the equation and harmony between the higher and lower selves. Number 12 symbolizes sacrifice and signifies immortality and the elixir of life. with the past, and the ending of friendships or close associations. Tarot card 13 also signifies discarding old ideas and modes of action. Death's sickle is a symbol of reaping, allegorizing the harvest of what humankind has endured in the physical state. The number 13 is neither lucky nor unlucky when considered by itself, and the number most often signifies a change for the better, a new birth. Temperance or Patience (arcanum fourteen) signifies a time of waiting, a time for putting aside petty squabbles, a time for learning patience and understanding. Temperance, the Angel of Time, symbolizes hermetic harmony and equilibrium, the working unity of the male and female principles of nature and of humankind; and in humanity, the merger of soul and spirit. The number 14 symbolizes the descent of spirit into matter and represents the activity of humankind in the round of the seasons. The Devil (arcanum fifteen) represents trouble. Being an individualist, the Devil upset the commandments of heaven, which enforced moral conduct, and so brought turmoil to the masses. He is the symbol of bad luck and of destruction, the antithesis of good. Fifteen signifies destiny and represents the immense force or power in the mind of humankind. The Tower of Destruction (arcanum sixteen), the Lightning-Struck Tower, depicts pandemonium, bedlam, and disruption. The struck tower symbolizes the dark night of the soul when the spiritually untested and immature seekers are confronted by a dramatic test of their faith. In this respect, the Tower of Destruction has also been referred to as the "Fall of the Angels." The number 16 symbolizes an ending, a move, or a change; therefore, this card can also signify the breaking up of a romance or a love affair. The Stars (arcanum seventeen) represents good luck or hope. The seven small stars on the card symbolize the universe along with the charity and hope represented by the number seven. The water in the stream before which the woman kneels symbolizes patience, utilized in overcoming obstacles. Above the kneeling woman's head are seven stars, symbols of solar energy directing beneficent rays on the enlightened adept. Directly above the woman's head, the top star—the star of the Magi—indicates the challenge presented by youth in its attempt to revitalize the earth. The number 17 represents wisdom and immortality. The Moon (arcanum eighteen) is the representation of unknown facts, of knowledge obscured, and an interference with the search for hidden knowledge. The Moon's magnetism preserves and generates life, and the dog pictured on the card undoubtedly belongs to Hecate, the goddess of the Moon's darker aspect, or to Diana, goddess of the chase. The Moon itself symbolizes the reflected rays of the subconscious, and the light falling from the Moon signifies the descent of spirit into matter. The number 18 is a sign of trouble, anxiety, failure, and hidden dangers in general. The Sun (arcanum nineteen) stands for good luck. The Moon (arcanum eighteen) gives insufficient light to illuminate hidden subconscious knowledge, but the Sun brings clarity, resulting in understanding, comprehension, and happiness. It enables adepts to see the essence of their acquired knowledge and fosters further enlightenment. The Sun card symbolizes complete identification with life here and now, and the hope and possibility of a life, or lives, yet to come in a higher state of being. On The Judgment (arcanum twenty), Gabriel's trumpet summons the adept to newness of life, to change. The Judgment is a positive card, bringing portents of goodness and happiness. The man pictured rising from the depths of the earth represents self-consciousness. The woman rising with him symbolizes the subconscious, and the figure of their child represents the regenerated personality of the adept made manifest. The card does not refer to a final or universal judgment, for the earth traveler is summoned to judgment many times by the cyclical workings of karma. The World (arcanum twenty-one) is the last numbered card of the Major Arcana and presents an allegory of transmutation completed. The adept has reached the ultimate end of his or her journey and has achieved an innate knowledge of all that is good in the universe, which is symbolized by the wreath that surrounds the Virgin. The World card represents honesty and truth, as well as success, harmony, and attainment. The figure of The Fool (arcanum 0), stands for an individual who becomes so involved in the occult sciences that he or she misses the path to spiritual development. The Fool also reminds everyone that they learn from their mistakes. It carries a small pack on a stick, symbolizing the karmic debts which all men and women must carry through life. The Fool warns the wise that the more they know the less they really know, once they have become aware of the vast unknown. The 56 cards of the Minor Arcana symbolize the four basic component groups of medieval society. 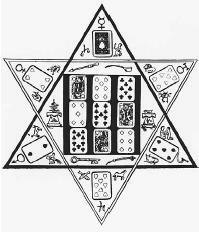 The pip cards, therefore, are divided into four suits, each bearing a symbol representing one of these groups. Batons, also known as rods, which once represented the peasant or serf class, have come to be the symbol of money and financial interests. Coins, the card of the merchant or tradesman class, symbolize enterprise and worldly glory. Cups, the symbol of love and happiness, is the tarot representative of the clergy, while swords stand for the medieval nobility and allegorize hatred and misfortune. Each of the four suits of the Minor Arcana has its own royal family. These are the king, queen, cavalier (knight), and knave (page, young male or female servant). In the world, a king is a man who rules a major territorial unit, one who holds a preeminent position and is a chief among competitors. It is the same in the tarot. The kings of batons, coins, cups, and swords each stand for a powerful male person with superior qualities, knowledge, and abilities in the category represented by his symbol. A queen, in the world and in the tarot, is the female counterpart of a king, and the same may be said for the queen of each respective suit with respect for gender. A cavalier, or knight, is a man upon whom a corresponding dignity has been conferred by a monarch, and in the tarot, represents a young man with qualities much like those of his parents, the king and queen of the same suit. All royal families have servants, and so it is with the rulers of the Minor Arcana suits. The knave in each suit represents either a young man or woman of humbler station than the cavalier, who is at times tricky, even deceitful. Coins. Coins, or money, is the symbol of enterprise and worldly glory. The king of coins represents a man of refinement, wise in the ways of the marketplace. If the king of coins turns up in an inverted position, he will bring the negative qualities of doubt, fear, and danger. The queen of money represents the hope of acquiring the ability to overcome obstacles. If inverted, she becomes a sign of evil. The cavalier of coins symbolizes omens of disunion, discord, or quarrels. If this card turns up with the knight's head downward, its significance is reversed. The knave, or servant of the house of coins, brings good news. If the knave is dealt upside down, he becomes a bearer of ill tidings. The "spot" or numbered cards of the suit of coins are interpreted as follows: Ten brings the qualities of confidence, security, and honor. Nine signifies order, discipline, and an ability to plan. Eight is a sign of understanding. Seven promises success in life, gain for one's enterprises, and a general condition of advantage and profit. Six is read as a sign of a promising undertaking. The five of coins points to gain and riches. Card four predicts a successful enterprise. The three also points to a prosperous enterprise. Two is a happy omen of good fortune. The one signifies a beginning. Cups. Of more vital concern than money in the lives of most people are love and happiness. The king of cups represents a just man of fair play. Likewise, the queen of cups evokes the image of a well-loved, motherly woman. The knight of cups symbolizes a fair young man who possesses the same qualities as the king and queen. The page symbolizes similar qualities of love and happiness. If any of these cards are dealt inverted, their meaning signifies aspects of distrust and unhappiness. The ten of cups represents satisfaction in personal accomplishments. The nine means triumph. Eight insures the forthcoming fulfillment of a wish. Seven indicates the presence of fresh concepts or images. The six of cups reveals thoughts of past loves. Five portends a union, possibly marriage. Four indicates displeasure over a relationship. Three is a happy card, promising success. The two of cups symbolizes love, the result of one added to one. The one-spot alludes celebrations and good cheer. Swords. The tarot cards bearing swords bring associations of power, authority, hatred, and misfortune. The king of swords represents a man of authority, one used to issuing orders and seeing to their execution even if they bring about grief and fear. The queen of swords allegorizes a woman who is malicious, spiteful, selfishly domineering. The knight of swords brings to mind the same dark thoughts as the king and queen. The valet of this ominous suit can be seen as a spiteful, malicious, and prying young man or woman. Inverted, these cards suggest more positive applications of wealth and power. The ten of swords foreshadows tears, afflictions, and sorrow. The nine is a card of hope. The eight relates to general calamities, such as sickness or injury. The seven reverses the ill omens of its predecessor, with an upsurge of hope and confidence. Six denotes a voyage. Five is a card of sadness and mourning. The four mirrors thoughts of stillness and periods of solitude. The three of swords is the card of severance and removal. The two stands for friendship. The ace is a herald of triumph. Batons. 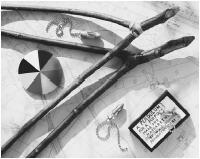 The batons, also called rods or clubs, are symbols of the peasants or serfs of medieval society. The king of batons epitomizes the self-made man, a symbol of success through hard work. The queen of clubs is a loving woman, but very reserved. The knight of clubs indicates the presence of a helpful person. The valet who attends the royal family of finance is a man or woman of extremely sensitive nature. If any of these cards are inverted, they indicate individuals who may cause severe problems. The ten of batons depicts gambling for high stakes. Nine indicates a loss of money. Eight brings good luck. The seven is a happy card of profit and gain. The six of batons is a portent of gifts, of gratification of desires. The five reveals thoughts permeated by avarice and greed. Four symbolizes gaiety and the pleasures money can buy. Three is a noble card, representing dignity transcending frivolous, impulsive actions. The two of clubs indicates a loss of money. The ace reveals a state of perfect contentment and triumph. It is essential to remember that the meaning of any card of the tarot is colored by the interpretation the reader gets clairvoyantly. Although it may often appear that cosmic forces rule the tarot, and that the sequence of a shuffled and cut deck is not accidental, the cards must still be regarded as a device to free the reader's psychically sensitive subconscious and to serve as a generator of spontaneous thought. Its legendary powers exist within, not without, the human psyche. Gibson, Walter B., and Litzka R. Gibson. The Complete Illustrated Book of the Psychic Sciences. Garden City, N.Y.: Doubleday & Co., 1966. Louis, Anthony. Tarot Plain and Simple. St. Paul, Minn.: Llewellyn Publications, 1996. Waite, Arthur E. A Manual of Cartomancy and Occult Divination. Kessinger Publishing, 1997.